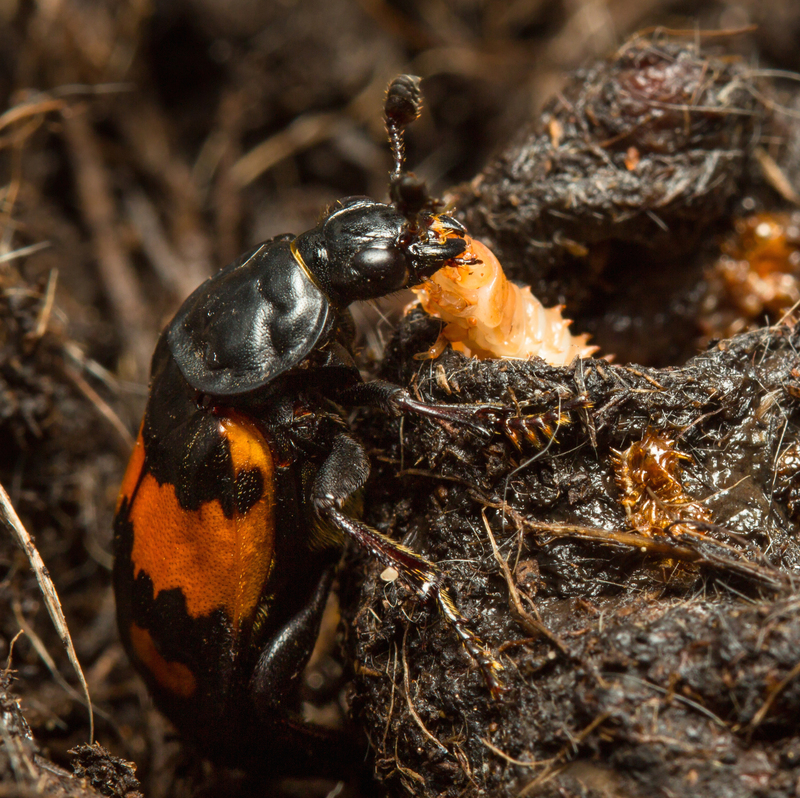 A new study reveals that when burying beetle larvae are denied parental support, they evolve bigger jaws to compensate. 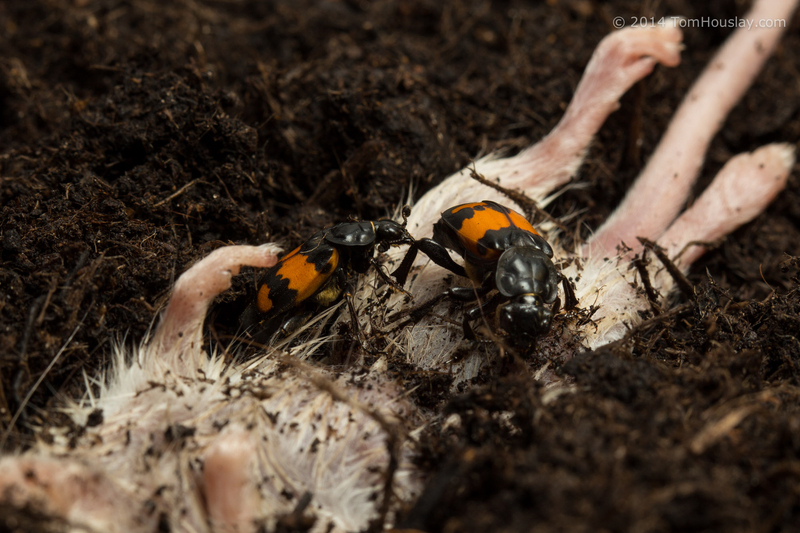 In gardens, parks and woods across the UK, the Sexton burying beetle Nicrophorus vespilloides quietly buries dead mice and other small vertebrates to create edible nests for its young. Most parents remove the animal’s hair and slash the flesh of the carcass to help their newly-hatched larvae crawl inside. Typically they also stay on to defend and feed them, but levels of care vary and larvae can survive without their parents. In a laboratory in Cambridge’s Zoology Department, researchers exploited the insect’s unusual natural history to establish two starkly different experimental populations and explore how parental behaviour drives evolution. The study, published today in the journal Nature Communications shows that larvae evolve distinctive adaptations in response to the different levels of parental care. The scientists behind the research exposed hundreds of beetles to two levels of parental care, over 13 generations. In a No Care environment, parents were removed as soon as they had prepared their mouse carcass nest but before their larvae had hatched. By contrast, in the Control environment, the parents were allowed to care for their young until they were ready to leave home. The researchers found that when parents fed meat to their babies’ mouth-to-mouth, the larvae evolved relatively smaller mandibles. These horizontally-aligned bladelike jaws play a vital role in the larva’s life, enabling them to enter the carcass and feed on the flesh once inside, but they are less important when parents help their young to feed. “By contrast, when the parents were removed from their young and larvae were forced to self-feed, the larvae evolved significantly larger jaws to compensate for the lack of help,” said Benjamin Jarrett, who led the study. Many previous studies have shown that social interactions in animals can drive evolutionary change through arms races which cause traits to become increasingly exaggerated. But animals also cooperate and it has been argued that when one individual contributes more, this can diminish traits in the less active social partner. Rarely, however, has direct evidence of this process been obtained. So what are the larval mandibles like in natural populations, where the level of parental care is very variable from family to family? 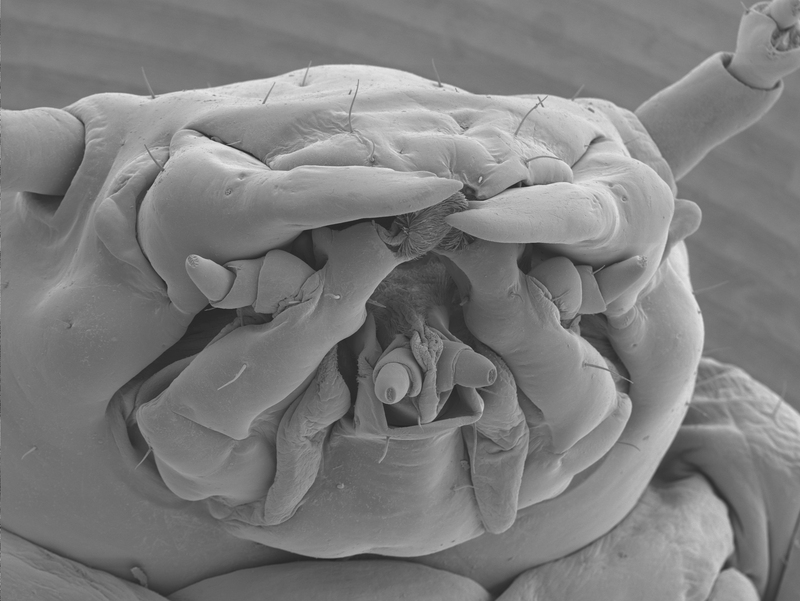 Here the researchers found that larval jaws are consistently large on average, regardless of the size of the larva. “They seem to be anticipating the worst possible scenario of receiving no help at all. This looks like a conservative bet-hedging strategy for survival,” said Jarrett. The laboratory’s experimental populations of beetles are continuing to evolve and are now in the 35th generation of experiencing different levels of parental care. “Our ongoing research investigates the importance of the social environment in evolution. We are watching the way that evolution unfolds in these experimental populations and they constantly teach and surprise us,” said Professor Rebecca Kilner, senior author of the paper. “The better our understanding of how evolution works, the better able we are to predict how animals will evolve in a changing world”.